Happy Monday! I hope you had a great weekend and had some nice weather to be enjoyed. A while back I spilled the beans that I am now part of the YNS Digi DT (woot!) and Karen has much in store for this team for some new images I think you all will love!!! Today I am sharing with you a sneak peek of YNS new release that will debut tomorrow and you sure don't want to miss out! 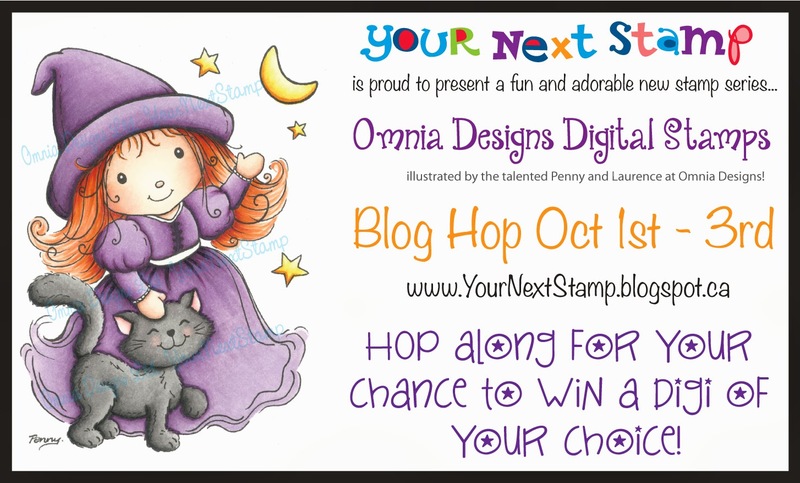 There is a blog hop that will be full of fun new images and some prizes to be won! Be sure to check back tomorrow and to see the full image and debut of this release!! Thanks for popping in for a peek! Have a great Monday! Welcome back to another Hambo Hoedown Wednesday! This week's challenge is getting sketchy using the following sketch. This is a great sketch to use up some scraps you have or even some fun washi tape! Hambo Stamps new fun Halloween digi is Fat Bat and by the wonderful creations from the other Bacon Bits, you can see the different ways you can use him! For my creation, I used the sketch and made a 4.5"x4.75" card for tucking into my kids lunch box. I also used my SU! slit punch to have this card be able to tuck into that slot and stay closed. The image is colored in with Copics and the paper is MS, while the base is SU! Going Grey. I then sponged the main panel and image circle with Distress inks in Linen and Tea Dye and popped up the image. Come play along and you could receive next weeks digi free!! Thanks for stopping by and be sure to check out the other fabulous creations by the Bacon Bits! Have a great hump day! Happy Tuesday everyone and welcome back to another Timeless Tuesday Challenge! Ally is our hostess this week and her challenge is to use dots to color your background or image. Well, I actually posted a card yesterday with this exact technique, but created something completely different for this challenge. I will share both with you. 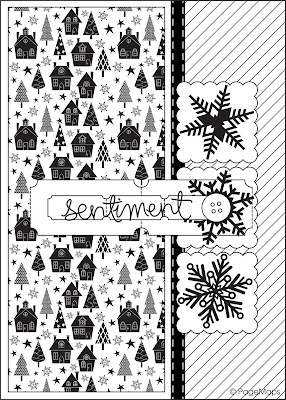 For my card, I used this months Flourishes release of Snow Scenes which is such a fun set! You can create so much with the different images this set has. I used Flourishes classic white cardstock for the base and some SU! Soft Sky for the main panel. I used some scratch paper to tear my mask used for the ground of the scene. I then sponged the ground using Distress inks in both Weathered Wood and Faded Jeans. I stamped the trees from Snow Scenes with Versafine ink and gave it a shot with the heat gun. I then used my Copic White Opaque ink to dot the snow throughout the trees, sky, and ground. My silver Spica pen was used to give the falling snow a little depth in color. The card was finished with sponging of the same distress inks around the sides, some silver cording, and sponging some Brilliance in Moonlight White along the ground and tops of the trees for a "smoky" look. So, that is one way to dot your background or image. Another is my card from yesterday. You can find all the details here but this background was made using my Copics to dot the sky, ground, and trees. We hope you come play along with us and be sure to link up over on the challenge blog. You just may be our next winner! Thanks for stopping by and also be sure to check out the fabulous creations made by the Timeless Tuesday Team. Hope you all had a great weekend and had wonderful Fall weather like we did here in Tennessee! The first day of Fall actually felt like Fall! Yay! I wanted to share with you a Christmas card made with one of this months Flourishes release called Country Time Christmas. It is such a beautiful set and I was anxious to ink it up and make a masculine card with it. You can use this set to make it non-masculine too! I used this sketch from Sweet Sunday Sketch. I colored in the image with Copics and dotted the background and ground for a softer feel. I really felt this image needed some snow or at least a cooler feel that I used my embossing stylus and Copic Opaque White ink to dot in some snow on the image and along the ground. I also concentrated a bit on the bare branches of the trees to collect some snow in the grooves of the branches. I don't use my opaque white very often, but I like how this image turned out with it. I finished the inside stamping the tree from the same main image and using some of the stars as well. The patterned paper used is an oldie from my stash- Cosmo Crickets Wonderland. I always like that collection for a non-traditional holiday feel on the cards. Thanks for stopping by! You are always appreciated! Have a great Monday! Welcome to "Hambo's Time Machine" sponsored by Hambo Stamps! Today Hambo friends and the Bacon Bits Design Team are bringing you fun creations that depict something cool from the 1980's! It might be our favorite book, something in the news then, a fashion fad, a song, or something that really stuck out to us in looking back. If you arrived here from Kecia's blog, you are in the right place! If not, you might want to start back at the beginning at the Hambo blog to make sure you are eligible for the hopper prize! A prize will be awarded to one participant whose comic strip-themed creation tickles the Bacon Bits’ fancy in a hammin’ jammin’ way! Another prize will be awarded randomly to a hopper who comments on all of the blogs along the way. The winners will be announced on the Hambo company blog, Talk to the Ham, on Wednesday, September 25, as well as at the Hambo Hoedown challenge blog. We love comments anytime, but the deadline for prize entry comments is Sunday, September 22 at 5 PM CST. Don't miss it! Now swing on over to Deanne's blog for another great trip back to the 80's that will jog your memory -- or show you something you missed! Thanks for hopping by! It's Wednesday again folks and that means another challenge at the Hambo Hoedown! 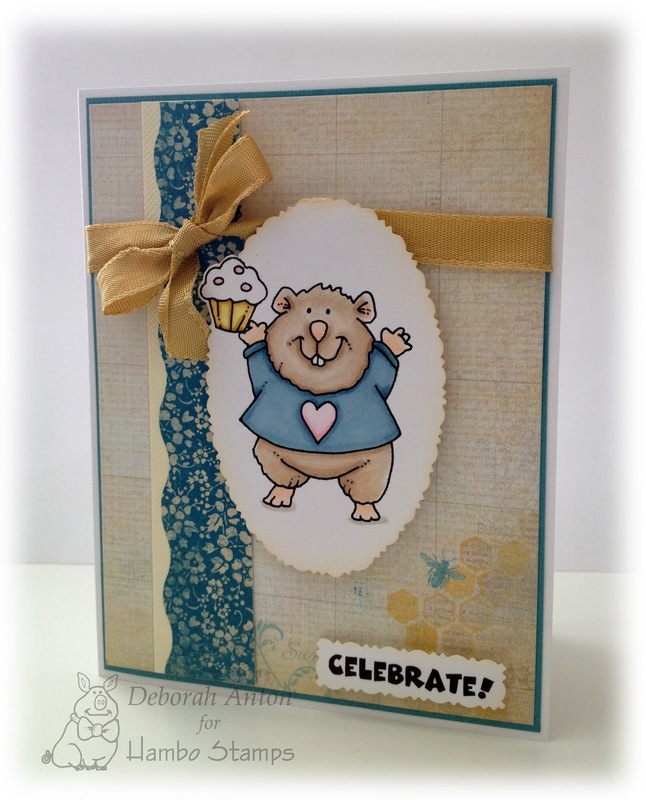 This weeks challenge incorporates this cute digi - Wee Henrietta Popcorn. 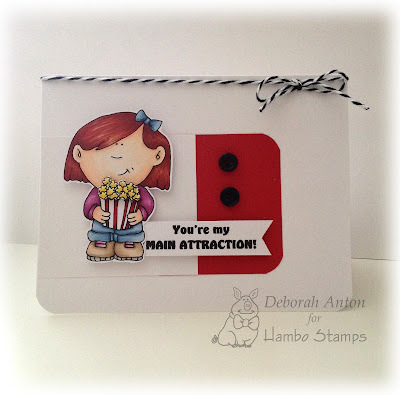 The challenge is to use pop ups on your card or project. 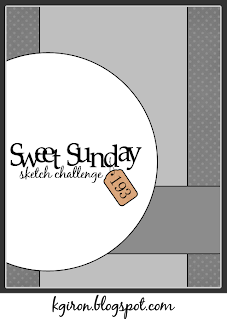 I used last weeks Freshly Made Sketch 103 for my layout. For the image, I colored Henrietta with Copics before cutting her out and popping her up. I also colored in, cut out and popped up her popcorn. I did add some yellow Spica pen to the popcorn for a little sparkle but it was very hard to capture on the camera, so you will have to take my word for it! :) I added the sentiment which is also popped up and two buttons and some twine to finish it off. I wanted Henrietta to be the "main attraction" on this card keeping it sweet and simple! DID YOU KNOW? Hambo Stamps not only sells funny and cute stamps and digi's, but there is a nice selection of paper, accessories, and individual mini Memento ink pads in a slew of colors!! Check it out!!! We hope you do head over to the Hoedown to play along and your chance to receive your free digi of the week! And while you are there, don't forget to take a peek at the other fun creations made by the Bacon Bits! Welcome back for another Timeless Tuesday challenge! This week, our hostess is Cheryl and she is challenging you to Let it Shine! 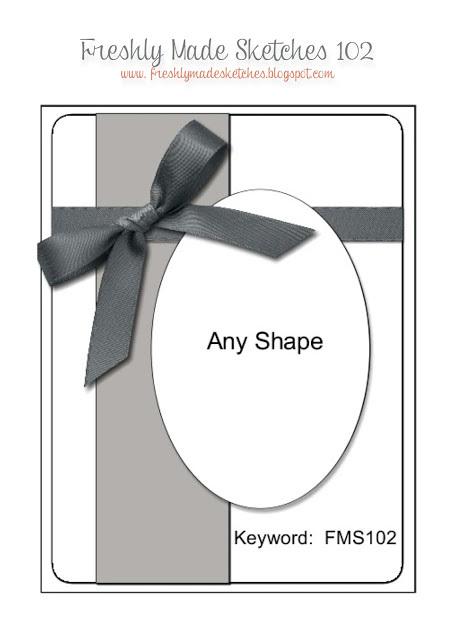 Incorporate a light source in your card: a candle, lamp, lighthouse, the sun---anything, as long as you "Let It Shine! 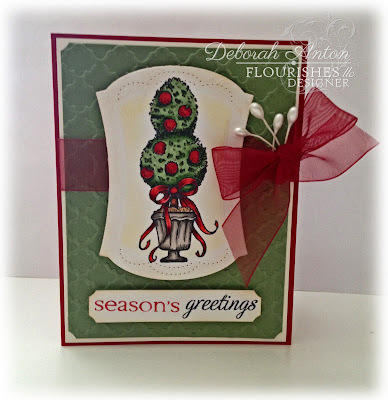 "I thought using this months release of Home for the Holidays was a perfect image to let my card shine! I used Flourishes Color Made Easy cardstock in Pistachio for both the base and for the middle nestie layer. I popped up the image over some Kraft and red cs from my scrap stash and finished it with a bow with sheer white ribbon and some bells. Two small gold metal dots were accented along the side. This image really speaks for itself, but I did incorporate one of the sentiments from the set to the inside of the card in a very simple and plain form. Thanks for stopping in and be sure to check out the fabulous creations from the Timeless Tuesday team! I love using SRM Stickers for quick and easy cards. A birthday for a good friend is coming up and I quickly threw this together so I could pop it in the mail. I used paper from American Crafts and MFT's Die-namic for the main panel using SRM's Fancy Sentiments - Birthday . I added a ribbon and some enameled dots to finish it off. Super easy! Thanks for popping in and have a great Monday! Whoop whoop! It's humpday! And that means we are back with another Hambo Hoedown challenge for you to play along with! I can't believe that it's the middle of the week already but I am not complaining. Yesterday was so crazy busy that I couldn't believe I was still standing at 7:00PM! : ) The best part of the day was seeing my boys get braces on and begin this whole new journey in their daily routine. Not sure if I am going to like it, but I am happy to get it done and out of the way. Just another reminder that they are growing up... :( Also, It is 9-11 today and I hope you take a moment to remember all those who lost their lives that day, for those service members who have made the ultimate sacrifice defending our freedom or injured doing so, and for remember those men and women still serving overseas. SO! 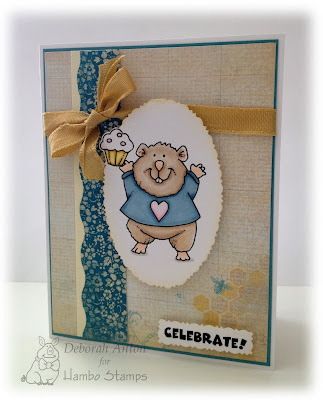 This weeks fun challenge at the Hoedown is to use DECORATIVE SCISSORS in your card or project. Remember those?! Time to dust them off and join in on the challenge. Remember... you can use any image to play along! For the straight panel, I used another decorative scissor along the edge for another detail and popped up the image over that. The papers are from Authentique and I completed the look with some ribbon from my stash. Thanks for popping in and be sure to check out the other creations made by the Bacon Bits! Have a great Wednesday! Hidden among the Design Team’s blogs today is our Mystery Blogger of the day. Comment on her blog and you could be chosen to win today’s set! The more you comment, the better your chances, so comment away! DO YOU WANT TO WIN OUR ENTIRE RELEASE? You can play in our Get in Shape Challenge – we will have multiple winners there! Deadline for entries is FRIDAY September 13th at 5 PM EST. Check out the link for the official rules! All five of our September sets can be pre-ordered now, even before you see them all! Take advantage our New Release Bundle and get 10% off when you purchase all five sets together in a bundle. This discount will be available for only 1 week following the release. All sets will be live first thing Friday morning along with the coordinating cut files for this release. Come back to the Flourishes Blog Saturday for the Winner’s Circle where we’ll announce all of our winners of this weeks’ challenges! How fun is this challenge? I love embossing and I just don't find myself doing that very often. I was happy to dust off my folders and create this card for the challenge. Before I get on with my card, I wanted to share that today is a big day for my boys as they are BOTH getting braces on!! Oy vey.... I am not sure what the day has in store for me once that gets done, but I have a feeling I will have some cranky boys on my hands. I've got my Aleve ready... I never thought we'd be at this stage this early, but I am ok with knocking this part of life out now before the teenage years hit. And luckily, they will not have them in for very long or need them again later! yay! For my card, I used some SU! red cs for the base, Flourishes Classic Ivory cs, and Flourishes Color Made Easy cs in the Pistachio collection. I stamped the image with Memento Black on the Ivory cs, colored it in with the following Copics, and cut it out using Flourishes Perfectly Pierced Hourglass die. The additional Copics would be G28, R59, W1, W4, W6, and some various E's for the small area at the base of the topiary. The background was dry embossed using a folder I had from Paper Studio and added some sheer red ribbon before popping up the image and sentiment. The pearls in the ribbon are pearl stamens I had and I just was finding another use for them. 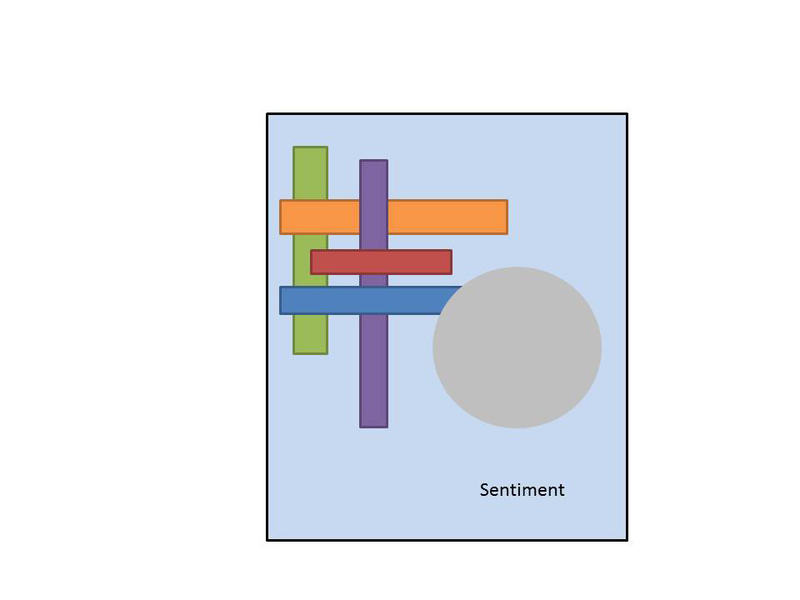 I broke up the sentiment to be on one line which I then snipped the corners to match the base and make the card flow. Thanks for stopping by and be sure check out the fabulous other creations from both the Senior DT and Timeless Tuesday Team!! I was asked to Guest Design for Becky Fleck's Card Maps this quarter and I most definitely did not turn that down. She and her site are amazing. I recreated the sketch in an actual 5x7 card which at first seems so big. But then, when you think about the average card you purchase in a store, it is that size. You just get so used to seeing a card made in the usual A4 size. For my card, I used Flourishes Augusts release of Autumn Blessings. I colored in the image with Copics and fussy cut around it to be popped on the "tickets." The tickets were made with my perforated Cutter Bee scorer and my ScorePal and a 1/4" circle punch used to make the half circle cuts. I then stamped the sentiment on that and layered it over a fishtail banner. I used Spellbinders decorative motif dies for the square panels. The dp is MME with the base being Flourishes Classic Cardstock in Ivory, and the ribbon is an old SU! stash I had. I finished off the card by adding some Prima pearls and a few singles as well on top. Thanks for popping and be sure to check out the other fun creations at Card Maps!